National Highways Authority of India is also well known as the NHAI organization. NHAI is looking to fill up the vacant positions of Young professionals under Finance department. NHAI is one of the Autonomous Body under Ministry of Road Transport & Highways, Government of India. 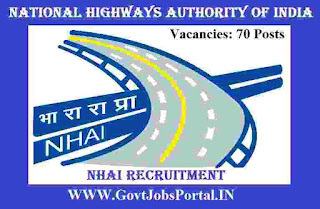 NHAI invites Government job applications for the appointment of 70 YOUNG PROFESSIONALS (FINANCE). This NHAI Recruitment is purely on contract basis. NHAI Recruitment department said that the number of vacant positions of Young Professional mentioned under this official advertisement may increase or decrease at the decision of the Authority. Applicants are advised to carefully read the full advertisement whose link we shared under IMPORTANT LINK section at the last of this post for details of educational qualification and other eligibility criteria before submission of on-line application. Vacancies to be Filled: 70 posts. Pay Band: Rs.60,000 per Month. Educational Requirement: Applicants who have a Degree in Commerce (or) Accounts from a well-recognized university of India can apply for this NAHI Recruitment 2018. Those who have completed their following qualification: “ICAI/ICWAI/MBA(Finance)” from a recognized University/Institute can also apply. Age Bond: Candidates age must be less than 32 years for applying these Government jobs. The age of the candidates will be calculate on the following date: “11th Dec. 2018”. The Candidates are directed to fill the online application form carefully in accordance with the eligibility criteria mentioned above. It may be noted that any subsequent clarification regarding eligibility etc. at a later date will not be entertained under any circumstances. There is no other way for applying this NHAI Recruitment process 2018. Candidates have to apply online before 11th Dec. 2018. After this the online link will be disable for applying.